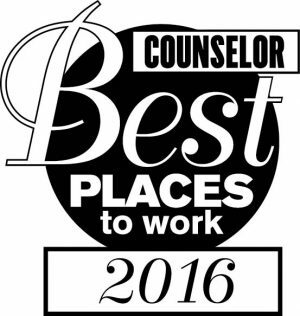 ST. LOUIS (September 21, 2016) – Promotional Consultants, Inc. (PCi) announced it has been named a Counselor Best Places to Work 2016, by the leading industry publication produced by the Advertising Specialty Institute (ASI) for the third year in a row. Counselor magazine, the voice of the promotional products industry, is published by ASI. Seventy-five (75) companies, out of more than 23,000 members, were selected by ASI for its’ annual Counselor Best Places to Work 2016 award – PCi placed 19th in the rankings, up four positions from last year. The ninth annual Counselor magazine’s Best Places to Work program mixed large and small, geographically diverse companies, identified by an in-depth survey process developed by Quantum Workplace. PCi employees completed a rigorous survey evaluating the company in 10 different areas, including team and manager effectiveness and satisfaction with company benefits. Only the top-scoring companies in the industry made the list. Workplace satisfaction is a strong indicator of the reliable, long-term service and experience you can expect from a company. This recognition reinforces PCi’s position as a leader in excellent client service and expert business solutions. For more information about PCi, please visit www.promotionalconsultants.com. PCi makes clients look good by providing perfectly-executed branded merchandise solutions that enhance their external and internal brands. We help you take advantage of marketing outlets that are often overlooked as driving value, but provide significant impact including promotional products, apparel and uniform programs, online company stores and award and recognition gifts. We make you look good in the process.